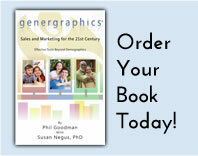 Genergraphics® allows you to market and advertise to one generation without alienating another. Web sites that incorporate the patented Genergraphics process provide the only way to sell the same product or service accurately to more than one generation at the same time. Generations for the most part can buy the same product or service, but they purchase for different reasons. Remember, no generation follows another in mindset, based upon the social circumstances they were raised with. Most notable is the difference between the Senior and the Boomer markets. Example: A client demo age group is 25 to 54. Within this age span, there are three generations to reach at the same time. It would not be cost effective to run three different advertising campaigns to reach the three generations with the same media. At present there is no company that knows what percentage of their client base comes from each generation. In other words, out of their 25-54-demo group, what percentage is Boomer, Gen-X or Echo Boomer? If the generations were known, think about how effective marketers could be in increasing sales by appealing to each generation and their specific mindset. 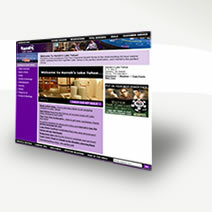 Genergraphics web sites are the only way to accomplish this effectively. Even if a client were to buy off on the idea of having 3 different advertising campaigns to reach these generations, no rating service breaks out their demographic research by generations. If a client created 3 different web sites to appeal to each generation in their customer base, current search engines cannot drive those customers to each site effectively.